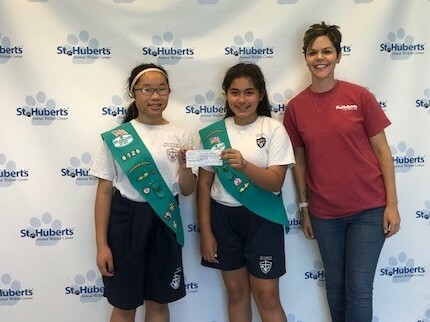 New Providence Girl Scout Troop 41105 chose to support St. Hubert's for their Silver Award project, in which they were required to help their area in a meaningful way. The girls began by hosting a donation drive in February at Pet Supplies Plus in Berkeley Heights and delivered over $500 in goods to the Madison shelter. Next, they hosted two pet education/animal ambassador events in May with younger girls in New Providence. At the events, they made over 140 pet toys for dogs and cats that were also donated, and educated visitors with how to best care for pets by displaying and discussing information on exercise, nutrition, training, grooming, and general health. The final step in their award was a Dog Walk event that they ran in New Providence in early July, where they hosted a series of fun activities for dogs and their owners and collected donations for St. Hubert’s. One of the stations was a pet obstacle course that they built themselves and have now donated to St. Hubert’s Doggy Day Care. Great work and dedication from this amazing group of young ladies! Girl Scouts Chengli and Gloria decided to devote their Girl Scout Bronze award project to helping animals. After interviewing St. Hubert’s staff members to learn about how St. Hubert’s gets involved in helping both pets and the community, the girls decided a donation drive was in the works! They set out to collect donations at local schools, a dance studio, and a library. The supplies and monetary donation were dropped off at our Madison location where they were able to see some of the programs that will benefit from their efforts firsthand. Great job girls! A message from Stephen, a cat owner in Oregon, about Tara Sannucci, our Pet Retention Specialist. “Even those of us who have decades of “experience” with cats can reach a point where we question what we should do in that special circumstance. [For example] whether to bring another pet into a household and, if we do, how to give the new animal the best chance to fit in. And that was my concern as I hoped to fit in a new, young cat from a shelter with my very bonded ”personal panther”. As it was, things could go from placid to screaming (panther’s) to the new cat’s hiding under the bed for extended periods, even though sequestered. So, what to do? I’d read the literature but it didn’t seem either of my cats had and I began to wonder if the daily standoff was ever going to get better. Enter Tara Sannucci, St. Hubert’s “cat whisperer”. Tara had counseled me through some previous pet-related hard times and came through again with my new “situation”. With practical and compassionate advice, she defused the confrontation between my pets and allowed us all to reach a new equilibrium. Today, the young Siamese is healing his terrors of his past and has become an aggressive, playful pal for my “personal panther”. I have added Tara’s wisdom to my cat information bank and feel more confident with my pets. Tara ministers (and that’s the word) to both needy pet owners and the animals themselves and I’m very grateful to her and St. Hubert’s. Somewhere in the Bible there is an observation about loving the least among us, and that’s what Tara and St. Hubert’s do, providing a light in an often dark and indifferent world. Addy’s separation anxiety is definitely getting better! I wouldn’t say it is completely gone, but it is getting better. For the first few days that we had to leave her alone she barked and howled for hours. Now she will sometimes do it for 20 or 30 minutes and then she settles down for the rest of the day. In fact, now there are some days where she barely barks at all! Her overall demeanor is much calmer. So she is headed in the right direction. No more destroying blankets either. Just a little barking. On a separate note, Addy is the best dog! We are completely in love with her. She loves other dogs and loves going to the dog park in our apartment complex. People love her, too. They stop me on walks so they can pet her. She gives off a sweet, friendly vibe. She also loves snuggling, and she has claimed a prime spot on the couch as her own. I hope you can share this story with other families whose dogs are going through some separation anxiety. It does get better. Hang in there! Also, I want to thank you for all of your help, Tara, and for the good work you are doing at St. Hubert’s. Having a pet helpline is a great idea!" After a slow introduction period of several weeks, Snowy the cat was not happy sharing her new home with Ava the dog and boy did she let Ava know! With guidance from our Pet Helpline, their family began working both Snowy and Ava on positive associations with each other and how to co-exist peacefully. Amy was thrilled to adopt a playful feline companion for her resident cat Molly, however after being introduced and living together for three weeks the resident cat still wasn’t as thrilled as Amy was. The cats were separated most of the time and when they were together, they seemed to be hesitant to get too close. Amy called our Pet Helpline and spoke to one of our behavior specialists and began reading the information on our Pet Helpline page (https://sthuberts.org/pethelpline) about acclimating a new cat to a new environment and creative positive associations between the two cats in her home. Amy began engaging both cats in interactive play separately twice a day and continued to work on making their interactions positive. Within a month of her initial call to our Pet Helpline, Amy reported that things were going “much better” and that the cats “occasionally play together and equally chase each other around the house”, with Arya even letting Molly “win”. We know that this relationship will continue to improve with Amy’s dedication! Origami Benefits St. Hubert's - Who Knew? A huge thank you goes out to Miriam, who has been helping St. Hubert’s in a variety of ways for several years. Miriam not only volunteers with St. Hubert’s each summer as a Critter Camp counselor, has fostered kittens, but also makes handcrafted origami Christmas ornaments, which she sells each year at her church’s Alternative Gifts Fair. The money earned at the fair gets donated to a charity chosen by the student, and Miriam has once again chosen St. Hubert’s this year! We are so lucky to have kids like Miriam on our team! Gracie & Oscar Reunite with the Litter Box! Liz contacted our helpline in early March and stated, "I have been struggling with this for a great many years. I have two cats. They pee (not spray) around the perimeter of carpeted rooms. I can't even remember all the things I have tried to remedy it thru the years." 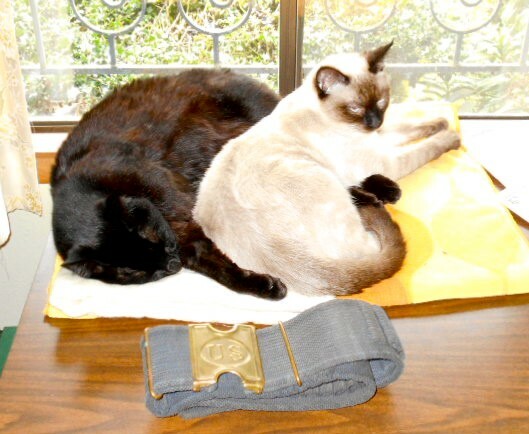 Two and half months later, after diligently following one of our cat behavior expert's advice, Liz had this to report on Gracie and Oscar: "I have really appreciated your help. I was directed well by you. It has made a world of difference and much greater peace for me!!!!! That is priceless! [H]opefully I am on the right track now and will not have any further problems. Fingers crossed. Thank you again, again, again, for all your guidance. It has made a huge difference!!! I think there would be a lot less cats given up if people had access to resources like you." Julia, an 8th grade student at Red Oaks School in Morristown, independently organized and ran two bake sales as part of a community service project. Not only did she raise close to $500 at the bake sales, but her donation is now part of St. Hubert’s 2018 Annual Fund Matching Gift Challenge! Julia states that she has a true passion for animals and hopes to work as a veterinarian in the future. She is quite knowledgeable about current sheltering facts and statistics and is excited about continuing her advocacy for shelter animals.Julia got to spend some one-on-one time with several of the animals at our Madison campus. What an inspiration! Irene, a recent St. Hubert's adopter, shared this lovely note with Tara, our Pet Retention Specialist. Tara offered behavioral support for Irene and her recently adopted cat, Cookie. "On December 26, I adopted a beautiful one-year-old tuxedo cat from St. Hubert’s in Madison. She was my Christmas present to me. She had been though devastating hurricanes in Puerto Rico and was very timid and withdrawn. The only thing that was familiar to her was her name, Cookie. She perked her ears whenever she heard it, and so I decided to keep it. With much patience, along with the outstanding support of the behavioral staff St. Hubert’s, Cookie is blossoming into a happy confident cat. "During the first few weeks in my home, Cookie hunkered down next to the toilet in the powder room. When she ventured out, she was startled by everyday sounds such as the furnace, garbage trucks, airplanes and even the coffee pot. During our three winter nor’easters she hid out, cried out and shivered. “It’s okay,” became my repeated response to her fears. Now whenever she reacts to unexpected noises, I just say “It’s okay,” and she goes on with her daily activities. "These days, Cookie enjoys basking in the sunshine and looking out the windows at the birds and squirrels in my yard. She sits by the front door in the morning waiting for the mail to drop through the mail slot. Once it does, she sniffs it as though she has won a prize. When she wants to play with a wand toy, she swats my foot and runs toward the closet where I keep it. Then she continues this pattern until I go get the toy. Recently, she has discovered that when I have my hand tightly closed, a treat awaits her discovery. When I call, “Here Cookie," she comes running to sniff my hand and waits for it to open and drop the treat. During the winter months, watching Cookie grow and overcome her fears brightened my days. Now the two of us are enjoying spring together. "Thank you, St. Hubert’s for bringing Cookie into my life. Thank you, Tara for helping me transition Cookie into her new life. St. Hubert’s is a beautiful facility with employees and volunteers who care about the animals and those who adopt them." Aidan and Evan Alvarez, two middle schoolers from Roosevelt Intermediate School in Westfield, were asked to do some service work for school. Having their own dog at home as well as being avid animal lovers, they decided to organize a donation drive to benefit the animals of St. Hubert's. After learning about what was most needed at the shelter, the boys created and posted signs throughout their neighborhood and community. They designated a local gym as a drop off spot and placed boxes there for collection. On a daily basis, they picked up the donations and brought them back to their home to sort and organize. The drop off at St. Hubert's took place on Sunday, April 29. The boys delivered armloads of bedding for our cats and dogs, as well as dog food and treats, newspapers, and general supplies. Aidan and Evan were then treated to a VIP tour of the shelter. It just goes to show what a huge impact kids can have! The following is a note sent to the Director of St. Hubert's Training and Behavior Center. "My husband and I adopted a 5 yr, old golden two months ago and, of course, immediately began basic training at St. Hubert’s, with the goal of getting her ready for pet therapy certification. Kaley is the latest amongst our dogs, starting 22 yrs. ago, who is training in your program. All of the goldens started in kindergarten and continued through super advanced and the great outdoors and the certification course, with some agility and rally thrown in. Nick, one of my goldens, had issues with large male dogs and got straightened out after taking Feisy I and II and Feisty agility. He was an amazing therapy dog for over 10 yrs. Two of our dogs, a border mix and a border, were St. Hubert’s adoptees, who I brought home when volunteering there as a canine coach. They both were coming from tough backgrounds. The courses steadied them, gave them confidence and I know enhanced their lives. Every trainer, over all of these years, like Kaley’s teacher Gail, has been positive, enthusiastic, professional and encouraging. The training school’s philosophy of humane education is something I subscribe to completely and actually talk about to children on pet therapy visits. In a topsy-turvy world, the consistency, availability and quality of your program is a godsend to people like my husband and myself who believe strongly in canines as good citizens, through kind, positive training. Honey Bear and my husband and I would not be family without Feisty Fido! We were embarrassed by Honey when we first got her, when we would go out in public. She would get in fights, was un-walkable and car rides were unbearable! We first sought help in a place that showed dogs but that was not a good fit. Honey met force with force and when I asked for help for her biting was publicly shamed. That has never once ever happened at St. Hubert's Feisty Fido we were welcomed and helped with all our problems from biting, pulling, aggression to how to be calm!!! We can now ride in the car without a panic attack!!! We can go on walks and go out in public. We are not perfect, but we now have the skills to recover so much faster and Honey has a way of asking for what she wants without hurting us. I cannot thank Meg and the team at St. Hubert's enough. St. Hubert's Fiesty Fido is a a turning point in our relationship with Honey. Rawhide Graduates with Flying Colors! 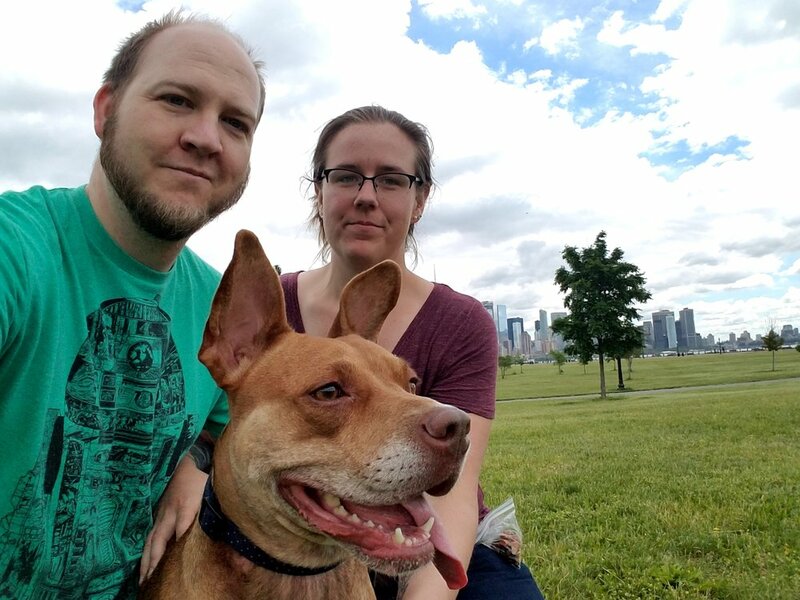 Rawhide's pet parent, Roni, describes his adoption as fate, but she still knew signing him up for basic training was a great idea to get him started on the right paw! At first, Rawhide had a hard time learning how to "down" on cue, but he got it with lots of hard work on Roni's part and a soft bed for Rawhide. Roni and Rawhide recently graduated from Basic Obedience. Congratulations! Thanks to Ridge High School for Their Support! There is no acting going on when it comes to the Ridge High School Drama Club's commitment to helping animals. The students utilized their winter production of Annie the Musical to benefit St. Hubert's. Throughout the week leading to their production, the club's members asked their peers and the larger community for cash donations and wish list items for St. Hubert's. St. Hubert's was also provided with a full-page advertisement, free of charge, in their playbill. In addition, the students invited St. Hubert's to set up an informational table in the performance hall's lobby and some of our wonderful volunteers provided information to the play's attendees about adoption and other ways to support our organization. 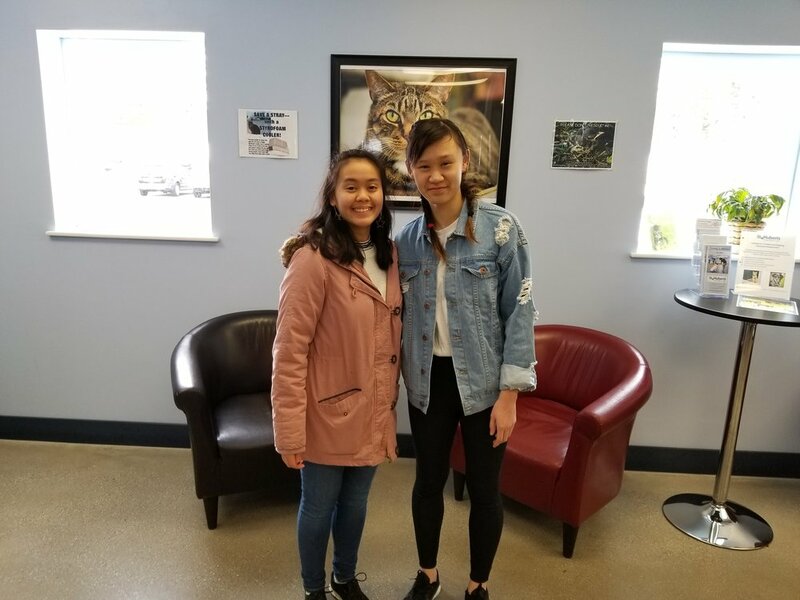 Two of the leaders of the Drama Club, Olivia Gong and Loan Ho, visited St. Hubert's with the collected donations, and they had the opportunity to meet our adoptable animals. Bodey is a Good Boy! lofty and noble. He is loving, goofy, wiggly and had so many kisses for anyone and everyone. scholarship [to the Training and Behavior Center] so Bodey could learn the basic training he needed. Every Friday night we went as a family to his class and learned from his excellent teacher at St Huberts. Bodey learned quickly and eagerly in the fun, patient and supportive environment. 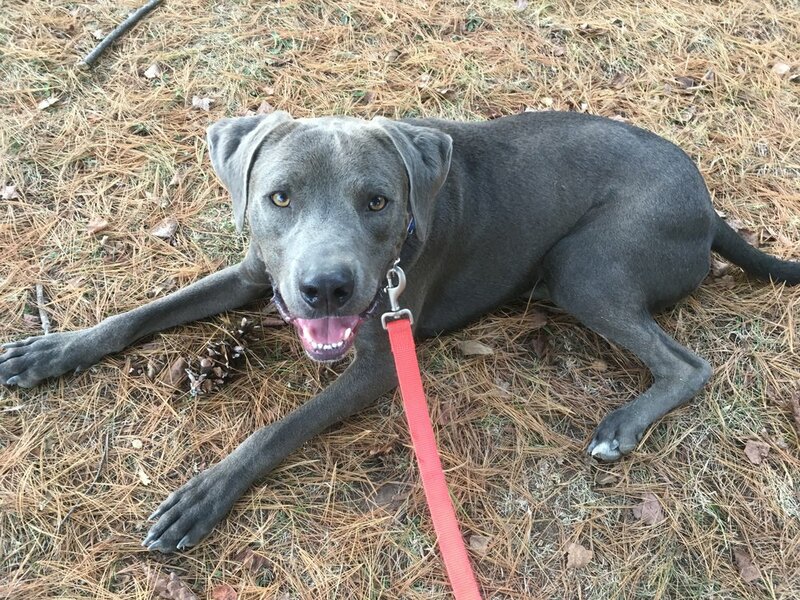 Our instructor Amber also helped us with many of the not so fun parts of Bodey’s personality, like his love of chewing shoes, and his need to lunge after squirrels. With her help and instruction, we corrected the behavioral issues and grew closer with our wonderful dog as owners and as a family." Wimbo, a Dog from Puerto Rico, Graduates from Basic Obedience! Emma, Siya, Ria, and Anvita, from William Annin Middle School in Basking Ridge have graciously made a generous cash donation to St. Hubert’s. After meeting Humane Educator, Karen, at the school’s ‘Day of Giving’ event, the girls decided that they wanted to raise some funds for the animals of St. Hubert’s. The girls love to sing, so during the holiday season, they spent an evening singing holiday carols in their neighborhood and collected cash donations, which they donated to St. Hubert’s. All four girls are interested in volunteering for St. Hubert’s in the near future and Emma even has dreams of becoming a veterinarian one day! The girls were given a VIP tour and got to meet some of the animals currently up for adoption! Amazing job girls!